Our recent weather reminded me of the need for every guy to have a good umbrella, and I think the golf umbrella makes a nice option because it offers a "sporty-like" style. 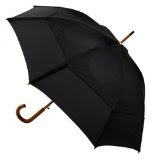 The GustBuster Classic 48-Inch Automatic Golf Umbrella (shown above) looks like a great gift option measuring forty-eight inches in diameter and thirty-six inches long. This umbrella has been wind tested to fifty-five miles per hour and carries a lifetime warranty.